I got up yesterday morning with a miagarane. I have had them for years, and they are pretty constant. I would LOVE to just lay down in a dark room with no interuptions but that is not possible. So I deal with it. I wear sunglasses inside, I puke all day and I look like I am going to die. Smells make it worse and constant chatter kills me. But I deal with it. I dont expect sympothy, and I dont expect my family to alter their lives because my head hurts. It would be nice if they would not talk quite as much, but that is not gonna happen. Since I didnt get much sleep the night before it probebly triggered it. We finally got some pigs. My sister in law had seen a sign about 40 miles away. It said 'hogs and pigs for sale.' So we called. noone would ever call us back. Then she said maybe she got the wrong phone number. So BR and I loaded the kids up adn drove over there to see. We got there and come to find out, they had sold out last year. But just forgot to take down the sign. In their driveway. They had recently went BACK into the business. cause like me they went to tryin to find a butcherin hog and they cost so much and were so scarce. But all they had was a pregnant sow. Babies due in 3 months. When we left there I called back a woman that has been pretty hard to get ahold of. She was finally home. Had 4 pigs left and wanted the astronomical price of 50.00 a pig. well since pigs are scarce as hens teeth you gota pay the price. We told her we wanted 2. I told her I knew she was staying at the hospital with her sister, but if I brought her the money would she save the pigs till she could get home and we could meet. She said "I got lights in my barn, come on"
It was already 6:00. So, we drove past our house and headed to hers. 85 miles in the other direction. She said she had hampshires. 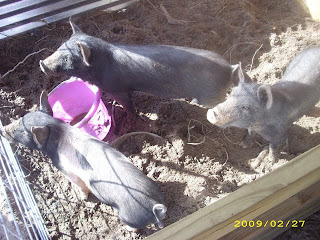 These are the black pigs with a white stripe around their chest, back and front legs. She had the runt male, he had a 'belt' but it was a little wonky. and the sows she had were all black. Not what we wanted, but beggers cant be choosers. Then we drove back home. BR went ahead and got 2 sows. And he tells the kids, that due to them being so hard to find, and so expensive, we will not be butchering these 3. We will raise them and then breed them and butcher THEIR babies. I agree in theory. But I want some REAL meat. not the crap I pay 4.50 a pound for at walmart that has no taste. And I want to see my grocery bill cut in half. With this scenario we are talking August before we can breed. Around December before they drop, and August before I can butcher. Thats a year and a half. I think if I come across one more, I am going to buy it. THEN if it looks better than his, we will keep mine for breeding, but one way or the other, I am getting me some pork chops come August. Come Hell or High water! Almost 170 miles, nigh on 10 o'clock and we had to get them settled in. Then I had to check on them through out the night. We are VERY scared of preditors. You remember the pics of the coyotes? Well, they were walking right through where we built the pen. ANd we couldnt move the pen closer to the house. 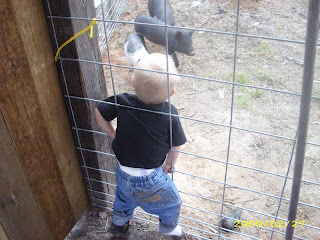 You dont want a hog pen in your back yard. I promise. Then I had to go to town and get feed yesterday morning. or rather 'pig starter' This stuff is high as a cats back. 18.00 for 50lbs. Thats outragious. We locked them up in the lean to the first night, and I went out and let them run around in the pen yesterday. When it came time to lock them back up, they were not going to do it. But maybe if they are not locked up they will survive if a coyote gets in there. where as if they were it would be like shooting fish in a barrel. Yesterday, while I was running around trying to put more wire on the gate (because the runt can get through it) and dealing with a few other things, including putting up groceries, (which is one of those things I despise). 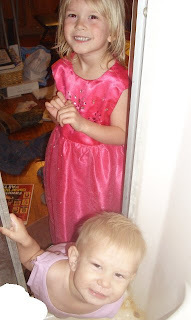 I always try to make the kids bring them in the house, its the constant trek back outside that kills me. I just hate it. Putting them up isnt as bad. but bringing them in is agervating to me. ANd its never ONE sack. just a run for 'bread and milk' for a family of 6 is at least 12 sacks. I was tired, cranky and had already ran around town all day. I had also driven to the horse pasture, stole some hay, fed, and got an extra feed bucket, I had the afore mentioned miagraine and still had work to do. The wind was trying to take the cap off my head and I had a chatterbox and a leach following me. The phone rang. It was the nurse at school. At 2pm. Matt had a headache and wanted me to come and get him. He had about an hour left. I had JUST been in town for hours. And I was NOT driving back in. I dont get any quarter when my head hurts. I still have to run them all over town, cook supper, answer why the sky is blue and the leaves fall off trees, and referee fights all day. So I was a bit cranky. I told him to lay down till 3. It would be about 2:40 before I could get there anyway. It was threatening rain, I had feed in the back, milk to put up and Bow and Rayley had already stripped out of their clothes. On my way up, with like my 4th trip of bags, I look down into this old tin bucket that was on the porch. The wind was blowing something feirce, huge gusts all day. and it lifted up some of the hay that was in it. Great, my kids found a buzzards nest. And got the eggs. and are trying to incubate them! JUST my luck. Then I got to wonderin. What has GREY eggs? I dont think anything does. Maybe a snake. which would be just about right. I decided to make them get rid of the eggs. 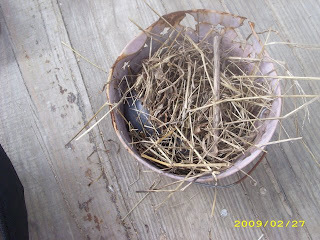 because if the bird had been off the nest, they were done for anyway. you have to keep eggs at a constant temp of around 100* for them to hatch. Snake eggs also have to stay warm, but I think they can go dormant for a while. Turtle eggs too. So if they get dug up or the ground freezes they will still be viable when it warms back up. 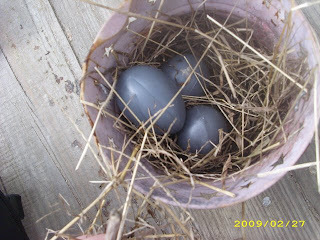 bird eggs are the same way to a point. but dont last as long as turtle and snake eggs. Which look ALOT alike. of course snake eggs bounce so you can tell the differnce. But, it just made me mad. Contrary to the way it looks, with 4 kids, 2 dogs, 1 cat, 18 chickens(with 10 more on the way), 3 pigs, 2 horses and a potbellied pig, I am NOT running a zoo. And I dont want things hatching out up here that I wouldnt drag home on my own. When I got it all unloaded and put up, I had to find Bow's shoes. 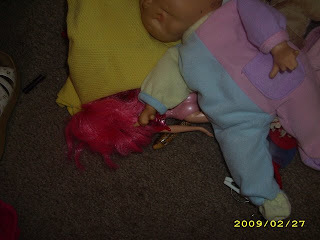 Rayley 'thought' they were in her room so I went into there, which is a DISASTER, and glanced at this. Well, I will admit, I am still a little skittish since the crap they pulled on Presidents day, so, my blood pressure went up IMMEDIATLY! I am not one for catching a live snake. BUT there is 18 baby chicks (yes I have lost two) not 15 feet from where this one was. Chirping their little heads off. And I knew he could get through the cage. 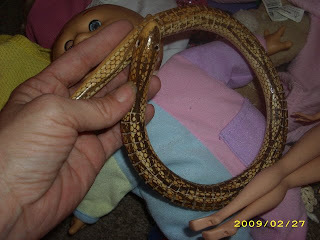 These kids had the nerve to bring a snake into the house, KNOWING they are not allowed to. then I reached down and grabbed its head. when my blood pressure goes up, my miagraine gets worse. That is also one of my triggers. any slight rise of blood pressure gets me. Now granted, sometimes I will be doing just fine, then all of a sudden I get a sudden pain in my head, everything goes black for a second and BOOM, my head is splitting in two. But when I already have one, it can be a mild one. Just a sunglasses and please dont scream headache. But it can get worse with just a little stimulation. That is what happened. Then I got REALLY mad. I dont know where my mind was. Seriously. I will blame it on the miagraine, having seen the eggs, that I NEVER wear my glasses and am blind as a bat, and the fact that I was just plumb tired. Preditors are on my mind, and its just one of those days. I had seen this thing in their rooms for months. And the first few times it gave me a little start. But, shortly thereafter it hits me that it looks fake. Today had just been one of those days. While checking out at walmart I had gotten 2 bags of oranges, they were 4.58. marked down to 1.89. So I got two 4lb bags, of course only one rang up right, so the lady was having to change it, and one of them came aloose- a dozen oranges went EVERYWHERE. We were chasing oranges from Hell to breakfast. So as I was walking out to the hog pen, I decided to look IN the bucket. I was still apprehensive, incase a snake was in the eggs and it had hatched out. I was still wearing my sunglasses, while walking in and out of the house. And they are not prescription, so everything is blurry and dark. Last years plastic easter eggs that had Spiderman plastic on them that had been taken off. So they were just a slate grey color. I swore I had thrown these away. Yep. I'm an idiot. but you have to admit, you'd be a little gunshy too if your kids brought home a buzzard. Oh the chickens. As you know I got some larger breeds at the feedstore the other day. Well, I called back to ask if they would be getting in any banties. Not anytime soon, I could order and they would be in at the end of March. Well, you cant put day old babies in with month and a half old babies. they would peck them to death. I needed them quicker. So I went to Ideal's website and ordered some. I got 8 bantams, Cochins and just normal. These are soo cute. I got some called Frizzle Cochins. Their feathers turn up. like they stuck their finger (or beak) in an electric socket. Plus I ordered 2 Black Jersey Giant Roosters. I only need one, but you hate to only get one and it die. This will put me over my 25 birds that was my original goal, but not by much. They are coming in next Friday. The post office will call me when they get here. I am so excited!! THe banties will weigh about 2 pounds when grown. The Giants will be around 12. The average of my others is around 7 to 8. Here are some of the babies I have now. It was right before we change the litter, so it looks bad. I change it at least once a day. ahhh more work for me! Here are a few pics from the hog pen. Not a great shot of them, but here are the newest additions. At first it was just me and the youngest two. 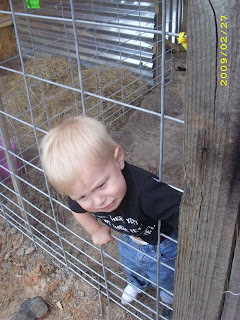 I was busy trying to get the gate secure, Rayley and Bow had been in and out of it about a dozen times, The wind was whipping and everytime they opened the chicken coop door it would slam into me. A peice of tin had already came at me like a guilotine and I was on the verge of just bringing the pigs in the house and lockin the kids outside. 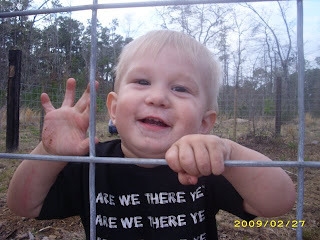 Yes, he is STUCK in the fence. Later Rayley was telling Brett about him doing it and that mo-ron argued with her, telling her that noones head would get stuck in there. And then proceeded to show her that even his big ole jug would come out. He was wrong. But I didnt rescue him. he finally got loose, but almost lost an ear in the process. ******Oh, and while I am trying to write this blog, I am constantly fighting them off of me. They are fighting each other, trying to sit on top of me. wanting something to eat or drink, or just talking. I keep telling Rayley if she will get OFF the couch and play Bow will too. But she was standing on the edge of the couch. reading a book, leaned over the back. and asking me what each word was. She doesnt want ME to read it to her. She wants to read it to ME, but cant read yet. And she just wants to keep it away from Bow. She is just trying her hardest to aggitate him. So, he is leaning over the back of the couch too. then he falls over the back. Into a box that has some Christmas decorations in it. A box that I have asked time and again to be taken outside. That my kids have continued to stack crap ON and in. 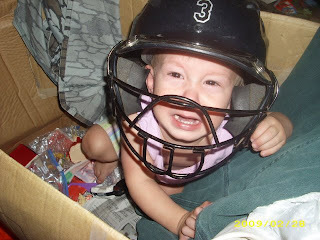 Well they put their baseball helmet in there. And Bow flipped off the couch and into the box. landing perfectly with his head in the helmet. I swear. It was a once in a lifetime thing. And since he was okay, I couldnt help but laugh. He wasnt crying, he was just mad as a wet hen. Yes, he is wearing a purple shirt and pastel striped shorts. Rayley dressed him this morning. the helmet was laying on its side over in that corner. This is just what my days are like. They are CONSTANTLY into something. or messing up something. there is no such thing as sitting still, being good, or staying out of trouble. ******back to the hog pen yesterday. ahhhhh he cant get to me!! Soooo nice!! Wonder if the hogs would survive if I left him out there? Notice how bad the chip is in his tooth? It just breaks my heart that he did that! 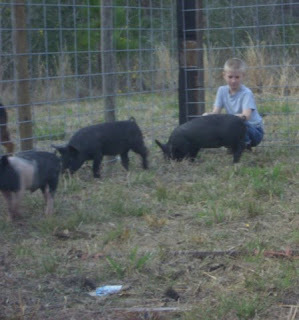 I told the kids to go out and sit, the pigs were very skittish, and hogs stress really easy. But none of them were capable of sitting still. Except Matt. He got the closest to them and was able to touch one. and I had a bucket of water that I poured out, the pigs had been rooting everywhere, I fiqured they might like the soft mud too. But guess who got to it first? By the time we got back to the house, Bow was having a melt down. He hadnt napped all day and just wanted to be held. I had to clean the kitchen, unload the dishwasher and cook supper. I had came up the house before the rest with Bow to get this started. When they came in, not much was done. Bow was a walking, crying, climbing mess. I opened the dishwasher, he would climb in. or start pulling things out. I would get him out and he would then start dragging things off the table. The bread, some plates from lunch, or out of drawers and cabinets. IF he wasnt hanging on my legs making it impossible to walk. When the guys and Rayley came in, Brett asked me if he could cook some of supper. I told him to have at it and went and sat down with Bow. With in minutes he was alseep. BRett cooked hamburger helper and it was good. I was very proud of him and it helped me out alot. Of course the kids wouldnt shut up long enough at dinner to not wake Bow back up. But I did get to get the strawberries cut up for dessert and got to eat most of my food. Now back to my kids and my days. After I got done here, I went and made lunch. While I had my back turned getting peanut butter out of the cabinet, Bow got into the jelly.. Before I knew it, he had it all over my hair. So I did something I dont ever do when the kids are awake. Or try not to. and NO I dont mean cuss. I will admit, I do that ALL the time. This is what I am blessed with each and every time I take a shower and they are awake. 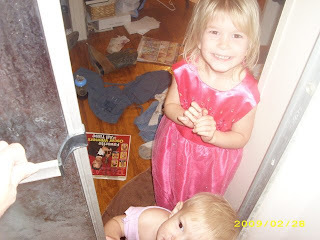 They bang on the door, they open the door, they get into a an argument in the bathroom. ANd yes, my bathroom is a mess. its something else I cant do while the kids are awake. I cant clean it. While I am cleaning the shower, or picking up clothes, Bow is in the toilet. Or if I am cleaning the toilet, he is in the shower. If I can keep him OUT of those places, he gets into my bathtub, that we have already decided I dont ever use and instead use as storage, and get out the stacks of newspapers that I put there, so they wont be scattered all over the house when he finds them. Since I buy 5 to 6 a week (for the coupons) , there is alot of paper in there. 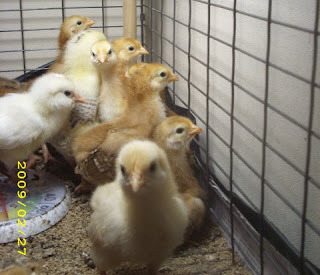 I started keeping them a few weeks ago, to line the chick brooder with. DO you know how many individual sheets are in a Sunday paper? If its not that he is unrolling rolls of toilet paper. Today he hadnt scattered much. I thought. instead it was all in the bedroom floor. but my camera batteries were out. And I wasnt in the shower but about 5 minutes. just long enough to wash my hair. I swear! Okay, This morning I woke up and felt like someone had drugged me. And I woke up at 6:45. Here it is 2 hours later and I STILL feel like I was drugged. But I jumped up and ran in here. The kids LEAVE at 6:30. So, I ran to the baby chicks. I had one that I was sure would be dead this morning, I barely kept it alive all day yesterday, and I would have to take care of it. I wanted to do it before I had to deal with Bow outside. So, I reached in to get out the feeder and waterer, they have to be filled twice a day. I am really starting to think that I woke up in someone elses house. So, I venture into the kitchen. the kids did get some of the brownies Brett made last night. (they didnt get cool till after their bedtime). I was glad of that. BR and I discussed it yesterday that I needed to remember to let them have some. 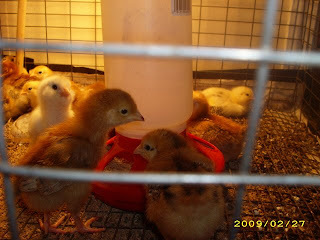 I just really cant belive that the kids are up, gone, and the chickens watered, fed, and disposed of. Is this really the same family that I just had to tell 7 times last night to take out the trash? The same kid who lost his backpack on Friday evening by getting out of the truck, heading in the house, being hollered at to 'go long' and throwing down said backback, catching the ball and not remmebering where he put it until 7:30 last night? Then I walked back into the living room and there sits Bretts homework from last night. Oh and Come to find out, (Rayley just started screaming at me that 'the baby is calling you') the sick chick from last night pulled through! I dont know if it will make it. But its at least standing up, and its neck is not quite as upside down. I dont know what happened. Its just one of those things that does happen. But I spent all day yesterday getting it water and making sure it stayed warm. I really expected it to die during the night. Speaking of the chickens. We went to the livestock auction on Saturday. Went and hooked up the trailer. Aired up the tires, and drove the 40 miles. We got there and all they ran through was some goats. I sat in the areana and just kept whispering to BR "I cant belive this." "I would have made a freakin fortune"
He just kept agreeing with me. See I used to have a goat farm. RIght before I sold it, I had 125 nannies. I had just made a sale of my raised up meat stock (billys I raised up to sell for meat or breeding) I was finally at the point of turning it into a profitable operation. ANd I had some beautiful goats. It all started off with about 10 foundation nannies my grandfather had, plus my 10. I spent a year or so breeding them, and got more nannies. I also got billies. I would cull out the ones to sell, and kept breeding. My last kidding had put me over the 100 number. When all of them kidded I would have raised them up, taken to sale the ones I wanted to and made some money. They were stocky, and solid. great for meat. And my foundation nannies were my babies. I worked with them all day every day. WIth the boys right along side me. BRett and Matt were under 3. But they could throw a goat pretty good. THey helped me pull goats when a birth was difficult and burry a goat that we had to put down. And they helped me feed them. I bet I raised 50 on a bottle. At one time I had 21 on bottles. It was hard work. But fun. ANyway, these goats they were selling were half the size of mine, and not near as good looking. And going for 40 bucks each. Of course I refuse to get in the goat buisiness again. When I sold my nannies, all but one of which I had helped give birth to, or held the minute they were born, I swore I wouldnt touch another. I just cant do it. It still breaks my heart to think of it. ANd we had went for pigs and chickens. Unfortunatly, noone is selling pigs. there were NONE. even the auctionier asked if anyone had any pigs to PLEASE bring them to sale. and the only chickens that went through were some month old ones that all looked to be roosters. and only 18 at that. So we spent the next 2 hours in the parking lot calling every feed store in a 200 mile radius looking for pigs. None. Then we drove to get me some chickens. I picked out 4 Americana's (I am going to mispell these names, cause I am too lazy to look them up), 4 buff orpengtons, 4 Rhode Island Reds, 4 Leghorns, 4 production reds. the Americananas lay green eggs. 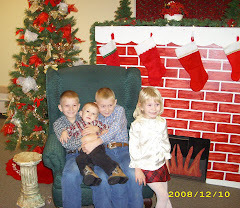 We brought them home and then got ready to go to my great uncle geralds presentation at the Masonic Lodge. He was getting a certificate for 50 years of teaching. Not just 50 years of being IN the lodge. But for knowing all the work, and being able to teach the work and being certified to teach it, for 50 years. Of course he was eligable for this last year. But it took an act of congress to get it for him. There are only like 12 of these given out in the entire state of Texas. Not a year. But in total. And there are ... I swear he said 97,000 masons in Texas... Thats a hell of an honor. Then it was back home to the chicks. Did I tell you they were in my living room? Yep. See theyhave to stay between 95* and 100* for the first week. Then you lower the temp by 5* every week until you hit 70, then and only then do they get to go outside. All was well the first day. Then the second day I got up adn one was not doing well. it had gotten trampled, or something, and was off to the side, cold and couldnt stand. So, I the only thing I could think of. I put it in my bra to keep it warm. It perked up for a little while, and I was able to get some sugar water down it. But eventually it died. Then when I woke up yesterday I had one that was about the same way. Except its neck was turned around like the excorcist too. I made sure it got water all day. This one was warm, I fiqure it just got smushed, so I put it in its own box in the brooder and every once in a while you would hear it chirping like crazy. You can hear it over all the rest. 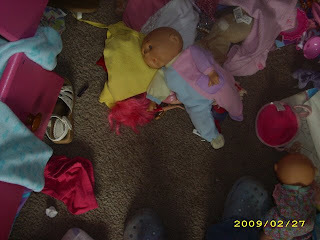 And if I dont jump up immediatly, Rayley will come screaming to me "YOUR BABY NEEDS YOU!" and she doesnt shut up until you go and deal with it. I would give it water and it would calm down. She even showed up in my room at like 2am. said "your baby needs you". This is the one that I fiqured was dead and gone this morning. But shortly after she got up and went over there, she heard it. Louder than all the others. and I went and looked. sure enough, it was walking again, but had gotten its head caught in the wire and another was on top of it. So I rescued it. its still a little wonky, head off to one side, and not totally stable, but doing much better. We have 3 practices a week. tuesday nights is at 7:30. Which for me means we wont get home till nigh on 9:30. If we are lucky. Thats over an hour past their bedtime. Cause even once baseball is over, you still have to drive the 20 miles home. When they asked who wanted to be team mom, I kept my mouth shut. even with my kids pointing at me and saying "she does it every year". then another mom nominated me. I am pretty sure I also got nominated to keep the books. That should be a hoot with Bowdrie. he is a handful when I aint doing something. But when you keep the books you literly have to COUNT every pitch. you have to know EVERY play. And when you are as scatterbrained as me, that takes ALOT of concentration. Oh and we have a new phenomemon at my house. Apparently Bow's gut is too big, or his legs are too short, or something, but his diapers wont stay 'done'. He isnt a fat baby. but he does have a gut. But you put a diaper on him, and shortly there after the tabs that stick together are attached to each other, and the diaper itself is hanging down between his legs. It looks like a lobster tail. And offers NO protection at all. I have taken to putting them on him backwards. they stay a little better. But then he is always mooning you with one cheek or the other. 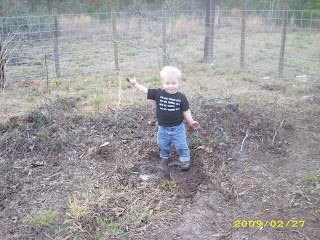 Plus, diapers are set up nowdays to catch what they are supposed to catch. THe front catches liqueds, the back... other stuff. so when you put the front on the back, and the back on the front you run into problems. The back still works well on the front. but the front is NOT made to go on the back. He would prefer I leave the diapers like they are supposed to be. That way, when they come loose he can grab hold and lead the way. I am afraid he is gona pull it plumb off one day. We were supposed to finish the hog pen this weekend. But BR walked out there and said "too bad we didnt just build the coop bigger and put a 'room' on there for the hogs. I agree'd. and next thing I know, we are cutting the hog wire between the coop and the pen and putting tin up as a wall. It was over in about an hour and a half. Versus us having to build a frame, dig post holes, make everything level, and put tin on top. Sometimes being lazy pays off. We did get the wire finished on the coop and are all set for these chirping bitties to grow feathers and get their stinkin rears outside.